Thus, I am starting my journey again, waiting for none. Before I begin my new section, I wanted to share the following, which I tried recently. 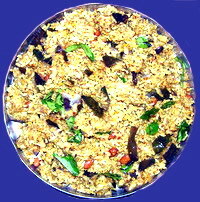 For this you need tender brinjal which should be cut into small dices and keep them in water. Roast cumin seeds and sesame seeds without oil in a kaDAi till they splutter. Keep aside. Fry the red chillies, black gram dAl, Bengal gram dAl, coriander seeds, cloves and cinnamon in a in a little oil till they become golden brown and release a fine aroma. Remove and grind with the copra shreds and the roasted cumin and sesame seeds coarsely. Keep this masAlA aside. Pressure cook the rice after washing it well and adding 2 cups of water for raw rice or three cups for boiled rice till three whistles. Sauté the brinjal, with mustard, salt, turmeric powder and extract from the tamarind till they become soft. Now add the masAlA. Take out the rice, add a little oil to loosen it and spread over a shallow dish. Mix the prepared brinjal curry gently so that the brinjal pieces are distinct. Add the ghI to this. Season the curry leaves and ground nuts and add. VAngi bAth is ready. Poppy seeds and aniseeds are to be added to red chillies and other ingredients while frying them in oil. The onion is to be cut and sautéed well and to be added to the ground masAlA powder and all these are to be ground just for 1 second retaining the coarseness. Rest of the method here is exactly the same as above. This goes with appaLam, chips or fryums. For this I took the common variety called “MuLaikkIrai” but you can use spinach or other greens that are bland and do not have their own special aroma like mint leaves or coriander leaves. Grind green chillies, ginger, aniseeds, cloves, cinnamon and garlic coarsely. Keep aside. Now sauté onion and tomato separately in oil with mustard for 5 minutes. Add the ground coarse paste. Chop the greens and add. Sautee for 5 minutes. Add 2 cups of water with turmeric powder, sugar and salt and let all these boil for 5 minutes. Add rice after washing to this. Place all these in a separate vessel and pressure cook. KIrai rice is ready. This goes with appaLam and curd pachchaDis. This entry was posted on May 24, 2011 at 8:05 pm and is filed under Miscellaneous BAth Varieties with tags aniseeds, Bengal gram dal, black gram dAl, brinjal, cinnamon, clove, coriander seeds, cumin seeds, curry leaves, egg plant, garlic, ghee, ginger, grated copra, green chillies, greens, groundnut, keerai bath, mustard, onion, red chillies, refined oil, rice, salt, sesame seeds, spinach, sugar, tomato, turmeric powder, vangi bath. You can follow any responses to this entry through the RSS 2.0 feed. Both comments and pings are currently closed.